Bloggity-Blog-Blog-Blog: Wizard of Oz LEGO? Hey, anyone want to support bringing one of my favorite things and one of Eric's favorite things together? 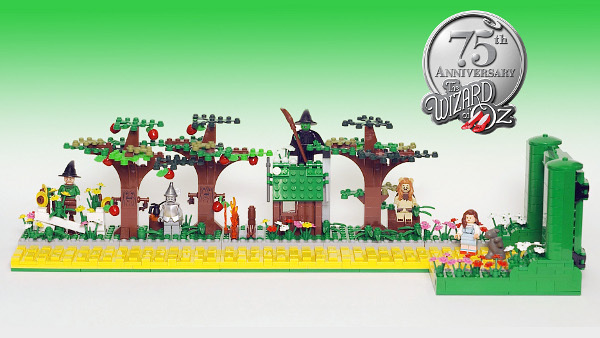 Go visit the LEGO CUUSOO page to vote for a Wizard of Oz LEGO set! Basically, a designer (in this case me) submits a concept and has to receive 10,000 supporting votes before LEGO will put the idea under review and consider making it into a official LEGO set. As the Master Model Builder at LEGOLAND Discovery Center Kansas City, I have been working with my marketing team and have brought Warner Brothers and LEGO into this venture as well. The Road to Oz recounts the story of Dorothy’s journey to see the Wizard --- as she meets the Scarecrow, the Tin Man, the Cowardly Lion, and encounters the Wicked Witch of the West --- and finally arrives at the Emerald City gates, all re-created in LEGO bricks. It would be neat to have a whole line! Thank you for your comments. I agree that The Wizard of Oz fits in well with LEGO and their values. If you want to support the campaign, go to the website, log in or create an account, then add your support. Again, we gotta get 10,000 votes of support to get LEGO to give the idea a review for sure. As a fan of LEGO and the wife of an Oz fan, this is a match made in heaven for me. So, if you want, please give support!